Harriet is a specialist property litigator, who also advises on related professional indemnity matters. Her practice encompasses the whole of property litigation, with an increasing emphasis on high value commercial property and development work. She offers thorough, direct and clear advice and assistance. Within just three years of starting practice, Harriet was recognised as an ‘up and coming junior’ for real estate litigation by Chambers and Partners, when she was noted for being “intellectually very able” and “genuinely committed to the client’s interests.” She is now described as “extremely hard-working, very thorough, very good-humoured and enjoyable to work with”. 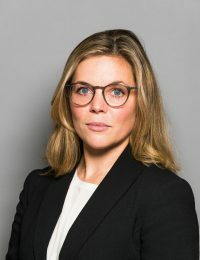 Harriet has appeared in the High Court, County Court, and Court of Appeal, as well as the Upper and First-tier Tribunals, sometimes on her own account, and sometimes as part of a team. She is also often asked to speak on matters relating to her practice, and has given talks or run workshops for the Property Litigation Association and numerous firms of solicitors. Outside Chambers, she enjoys playing and listening to music (the flute is her instrument), and improving her french. Although, this year, too much of her spare time has been spent thinking about and drafting the book she is co-authoring on the Right to Manage. GAIA Investments Ltd v. Abbeygate Helical Ltd  EWHC 118 (Ch) (overage: reasonable endeavours, conditional contracts) – acting for the successful claimant in this claim for a £1.4million overage payment (led by Mark Wonnacott QC). Bodker v. Hill (2015 – 2017, Chancery Division) – a dispute concerning an alleged joint venture agreement to develop out a property in Notting Hill (led by Mark Wonnacott QC). Settled just before trial. Masters & Ors v. 6 Bolton Road Ltd (2016, CLCC) (party walls) – acted for the successful appellants in this 2-day party wall appeal before HHJ Bailey. Christie v. The Wellcome Trust Ltd (2016, FTT) (service charges) – acted for the successful respondent landlord in a 3-day service charge dispute concerning the South Kensington Estate. Avgarski v. Alphabet Square Management Company Ltd  UKUT 367 (LC) – represented (pro bono) the successful appellants in the FTT (where they won in part) and before the Upper Tribunal in the successful appeal. Nata Lee Ltd v. Abid  EWCA Civ 1652;  2 P&CR 3 (adverse possession, boundaries) – acted as junior counsel on the appeal for the respondents. The decision on the status of litigants in person (in this case, the appellant at first instance) and their compliance with the CPR was recently endorsed by the Supreme Court. She provides high-quality and cost-effective advice.